Remember the days when email newsletters were hated by all and spam was a daily demon you had to deal with? Well, thankfully those dark days are gone and we can all enjoy the great content we’re after. I’ve gone through all my favourite (and best) subscriptions to put together the perfect list of email newsletters for web designers. Hopefully you’ll find a great load of content you can sink your teeth into on a weekly basis. If you know of a few to I haven’t mentioned, please let me know in the comments. Enjoy! Sidebar is by far my favourite newsletter for getting all the best links from the world of web/UI design and development. You can choose to get an email every day, once a week or twice a week. Paul Boag, who some of you probably know from the Boagworld podcast, runs a semi-regular newsletter where he provides links to his latest articles on UX, UI and web design. He also adds a few paragraphs of exclusive content. Definitely worth checking out. To get the newsletter you will need to become a member, but why wouldn’t you want to join one of the best CSS galleries around? The newsletter arrives every week and provides links to their latest blog posts, all of which are fantastic quality. The weekly digest from Invision is prefect for UI designers. It’s packed full of their latest blog posts which are always worth reading. Jake Bresnehan started Web Design Weekly to provide web designers with a no-nonsense newsletter that was filled with the best and most interesting links around. Worth checking out if you’re a front-end developer. Extra: I recently did a short interview with Jake, you can read the interview here. CSS Weekly provides the best CSS related links around, everything from SVG to gradient hacks. A really great resource for front-end developers. The Hacking UI newsletter is run by Sagi Shrieber and David Tintner, two men who are incredibly passionate about the web. Jam packed with more links than any of the others. The Smashing Magazine newsletter is a little different from the other on this list because, instead of just providing links and a small amount of text, each article or tutorial has an in-depth write-up from the editor. In case you didn’t know, there’s a newsletter for this site too! It’s called the Inspirational Newsletter and it goes out every two weeks. It provides you with the best web design links anywhere online and I also give you a quick overview of the latest content on this very site. 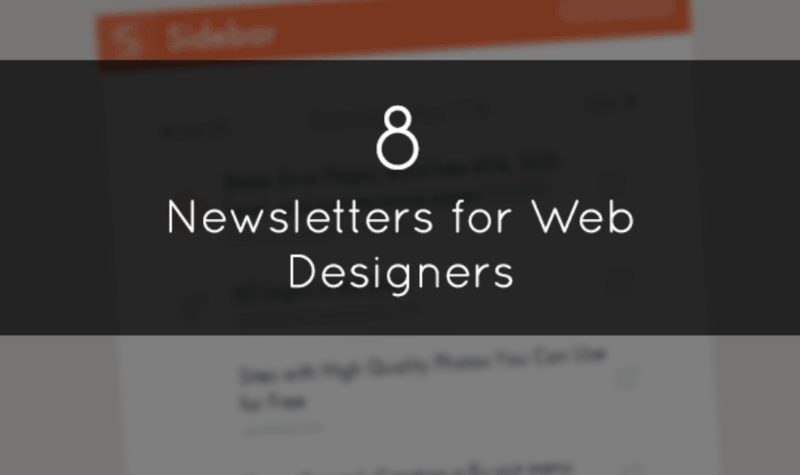 These newsletters are truly dedicated to all the inspired web designers. Fantastic list or resources that will give rich ideas in doing a web design.